A Second Bite: China must eats! 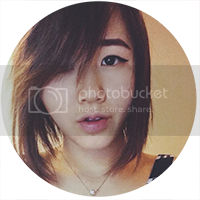 You probably do not know, but I am Chinese. In fact, I was born and spent the first five years of my life there. Since moving to the States in 2000, I have gone back three times, each time with a different "must do" on my agenda. The first visit was in 2005 and all I wanted to do was play with my cousins. The second trip was in 2008 and (being in that awkward preteen phase) all I wanted to do was shop. 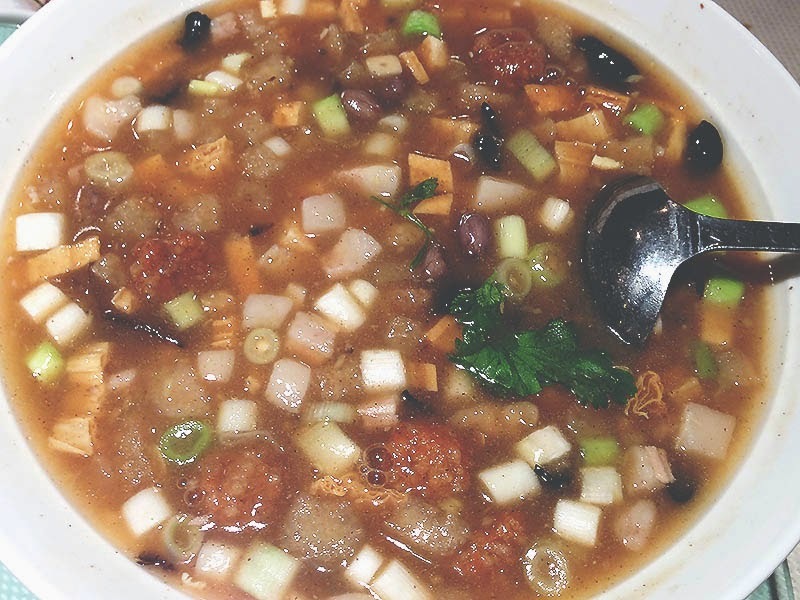 On my most recent trip, during the summer of 2013, my goal was simply to eat as much unique, strange, and delicious food as possible. 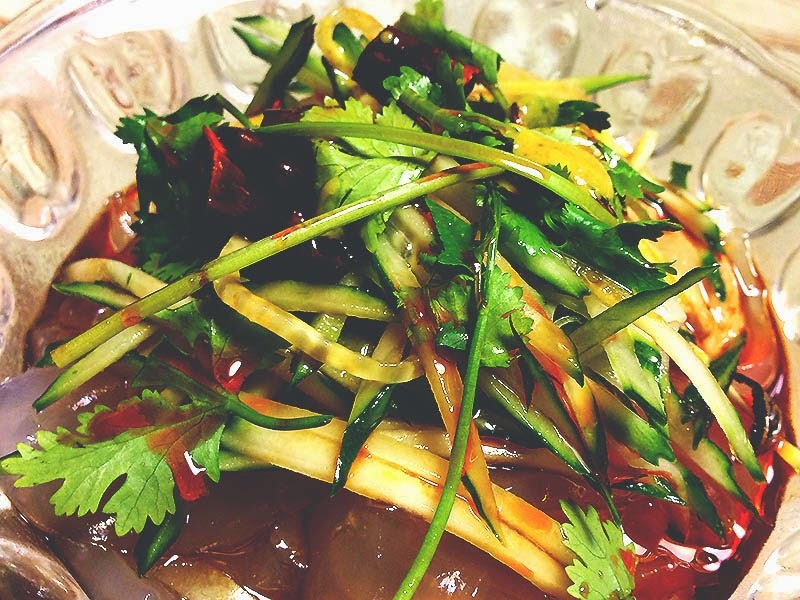 So here it is, my list of some of must-eats in China! It's a noodle, it's a process, it's a story, it's absolutely delicious. 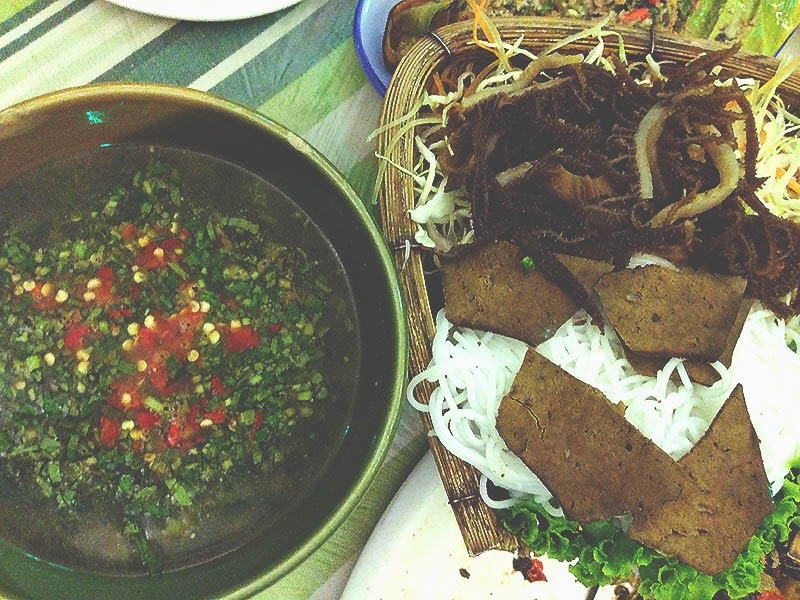 Yunan is known for its rice noodles and crossing bridge are probably one of the most famous. 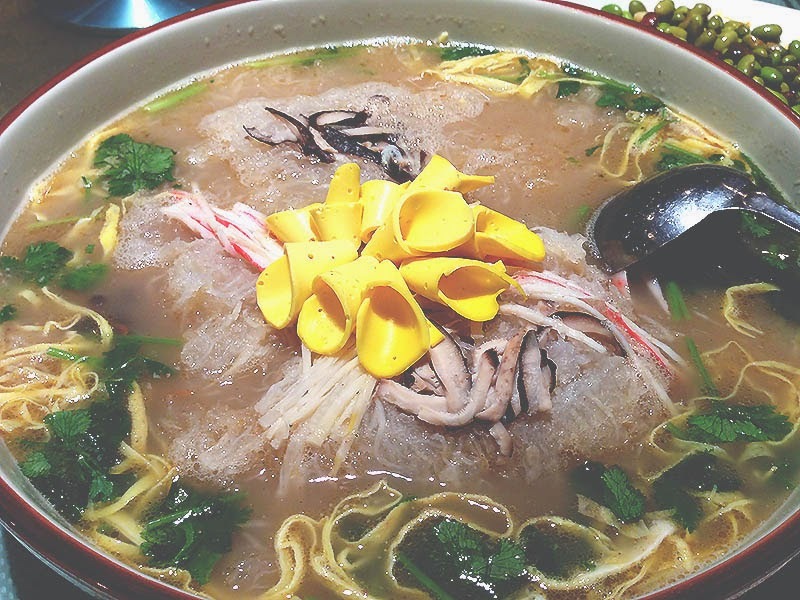 It's almost like Yunan's answer to Vietnamese pho: a hot, still boiling bowl of chicken soup is brought out to you along with separate plates of raw meat (and sometimes quail egg), veggies and aromatics, and rice noodles. Add in the meat first, then vegetation, and finally noodles before slurping down all that deliciousness. 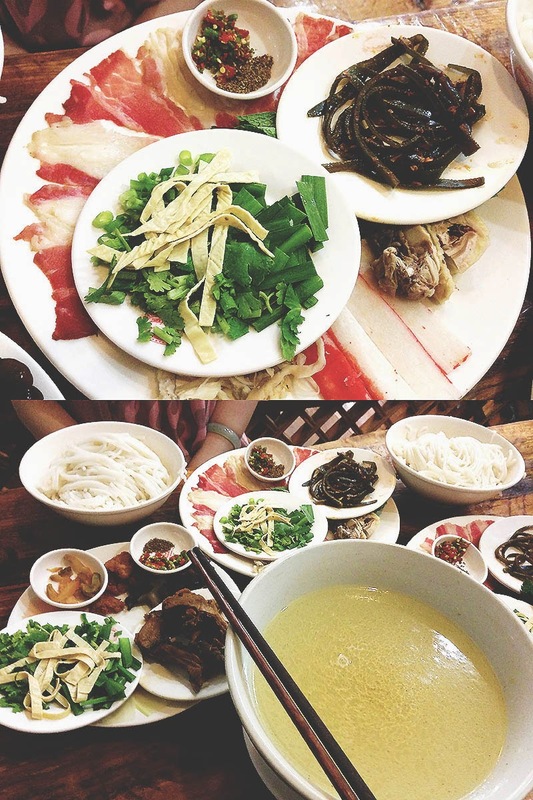 One last tip, my relatives have always told me that a true Kunming-er only eats the noodles and leaves the soup behind. Me? I'd rather finish just a bit of noodles and drink all of the soup. It's just too delicious! 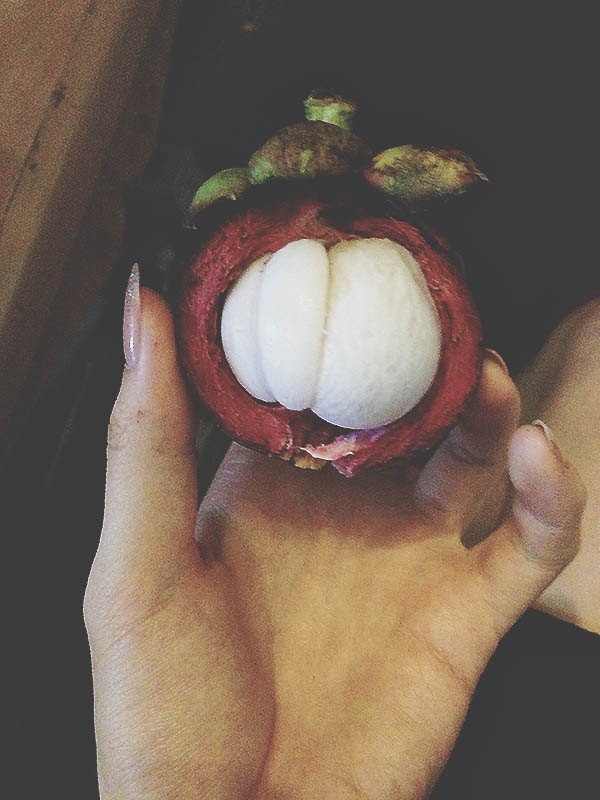 Because Kunming is so close to Vietnam, Thailand, and Xishuangbanna, they get a good amount of tropical fruit that is season, inexpensive, and oh so delicious. Stock up on the sweetest dragon fruit you'll ever eat, lychee, longyan, durian (if you're into that kind of stuff), yangmei, and mangosteen! 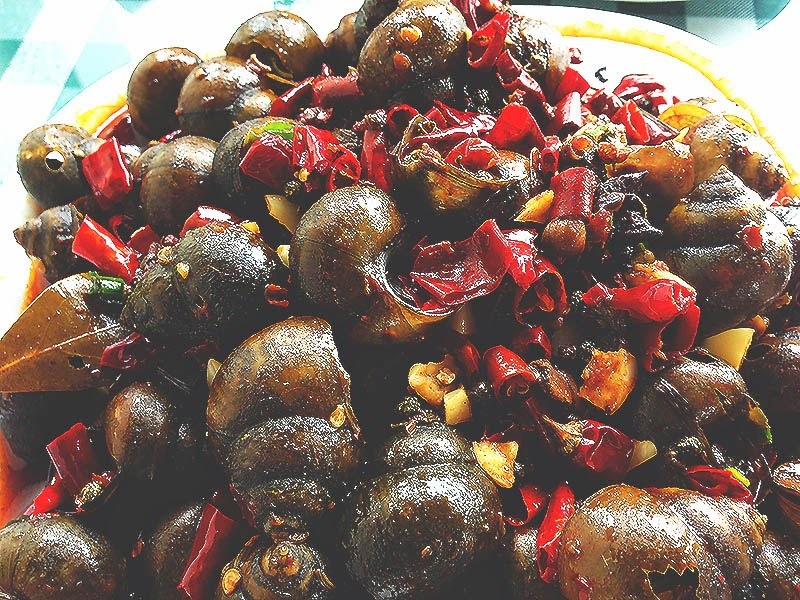 Another thing that Yunnan is well known for is its mountains, and where there are mountains, there are tons of wild mushroom life that are unavailable to other parts of the world. I got a chance to taste matsutake mushrooms for the first time (they are supposed to be the world's most expensive mushroom because truffles are fungi, not mushrooms) because they are harvested in Yunnan and therefore relative affordable compared to the rest of the world. My family took me out to mushroom hot pot, where, you guessed it. 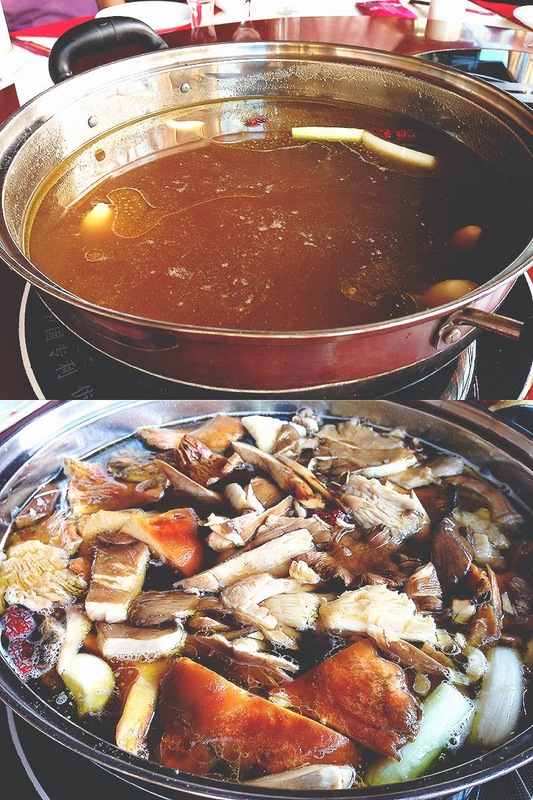 It was just hot pot with tons and tons of mushrooms. No meat! And trust me, with all the interesting flavors and textures, you won't miss meat at all. The Dai are an ethnic minority that lives in Yunnan and a subset or somewhat related to Thai people. Of course, they are most well known for their water festival, but their cuisine is equally delicious! It focuses on clean flavors, leans more towards acid, and extremely refreshing. Some things you should definitely try out at Dai style rice noodles, pickled vegetables, grilled fish, pineapple rice, and bamboo rice. 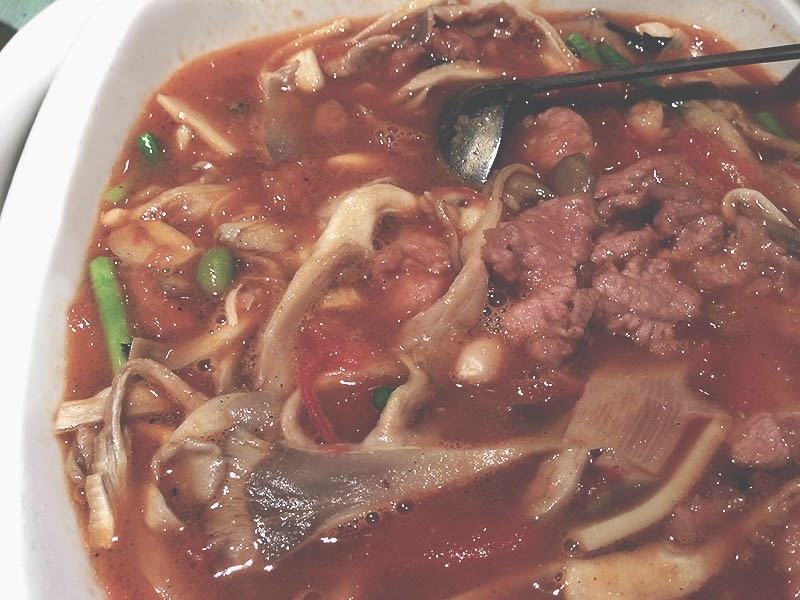 One thing that Luoyang specifically is known for is its soups and what is interesting is that most of these soups are served for breakfast. In fact, just go down the street and you're bound to find one soup shop or another with people squatting or sitting on low benches enjoying their morning meal. 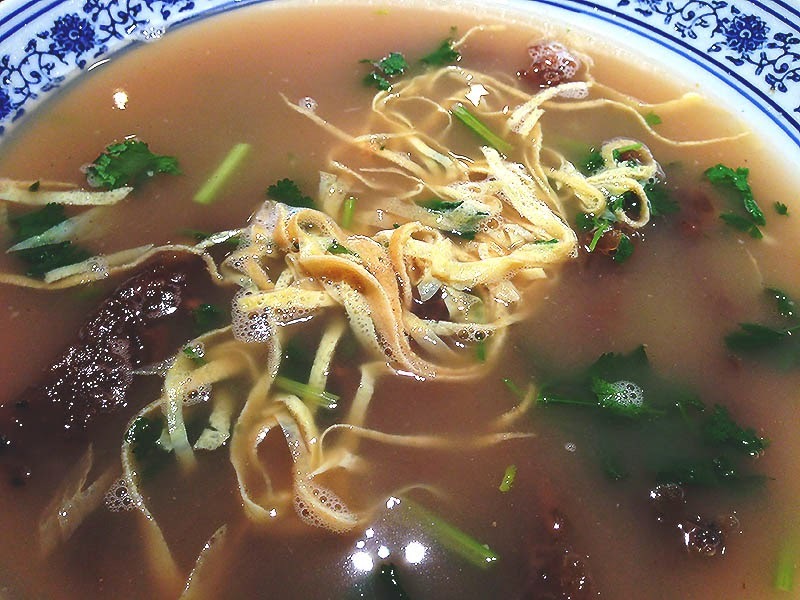 Order a soup, buy an extra order of 某 (a type of bread) and just dunk and slurp away! 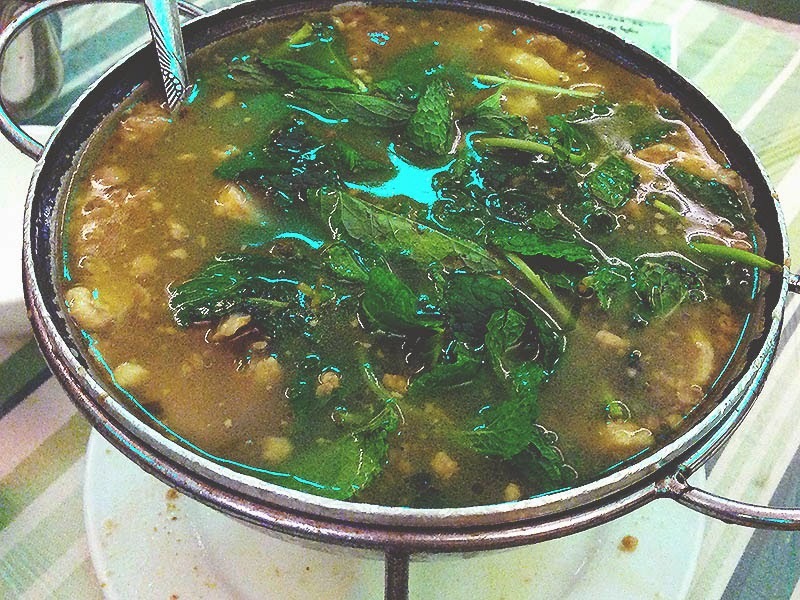 Some of my favorite soups are peppery soup 胡辣汤, donkey soup, and tofu soup. Pick your fish, pick your ingredients, pick your sauce, and wait to be amazed! 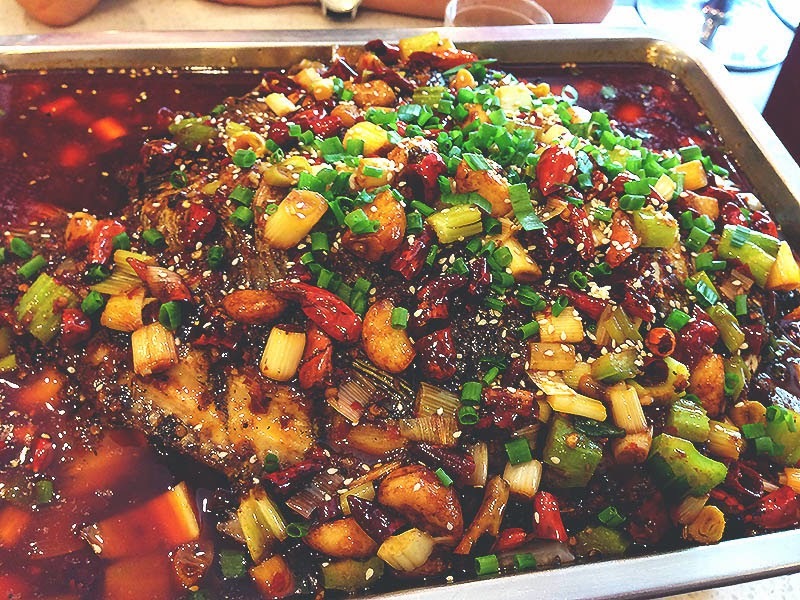 Though this is technically called roasted fish, the final dish is a wet preparation. You are given a choice of different types of fish, sauces (both spicy and non spicy), and things you can add to your fish. 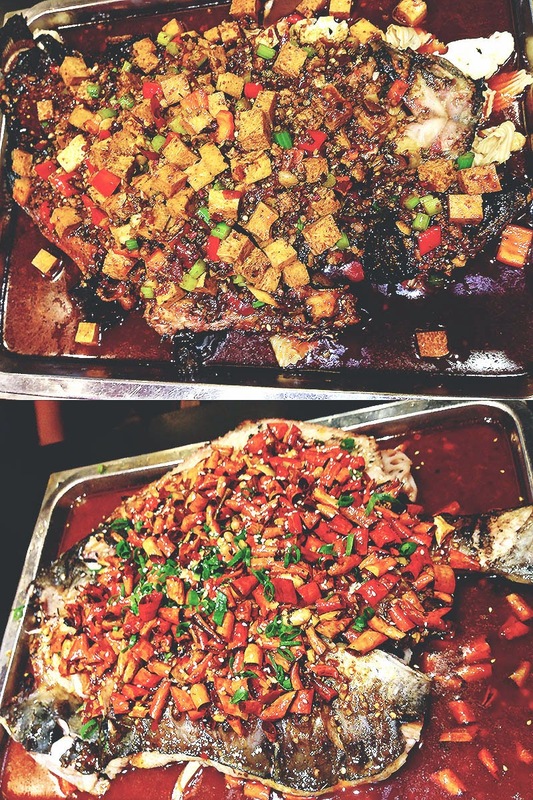 Once you order, the restaurant will go to the tank and scoop out the live fish, roast it, lay it on top of your additional ingredients, and pour the sauce on top before serving it out to you in a giant tray. My favorite combo is a light fish, either mala 麻辣 or xiangla 香辣 sauce (both spice level medium or high, depending on who I'm eating with), and napa cabbage, lotus root, woodear, and konjac. Yup, I had to add it. 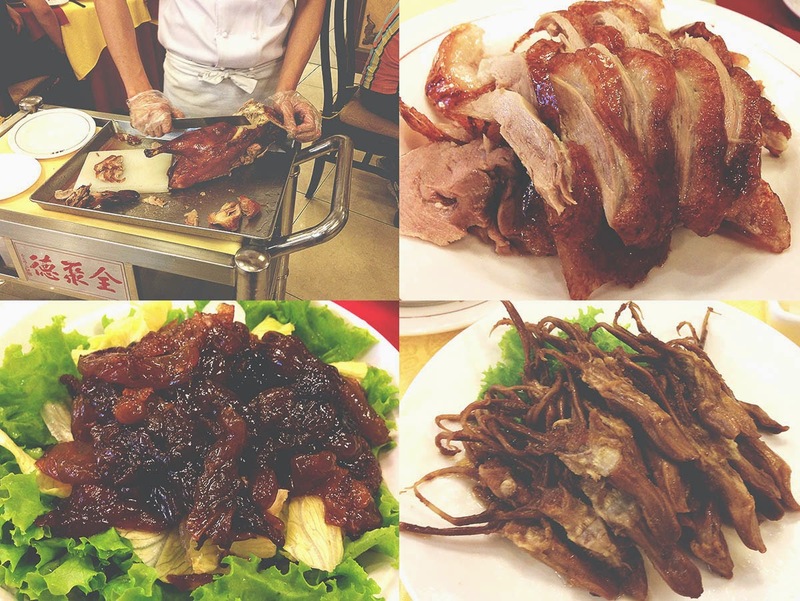 Even though I'm not a fan of duck myself, it's Beijing. Any local well tell you that most Beijing-ers don't like duck too much and would much more rather have mutton hotpot 涮羊肉 or lamb skewers 羊肉串, but I can't stand mutton, which is why it's not on the list. If you want to try lots of strange food, night markets are the way to go! I did go to the one on Prince's Mansion Well 王府井, which is a very touristy area so the prices are definitely jacked up, but it was convenient and my parents and I did not want to mess around with Beijing traffic. 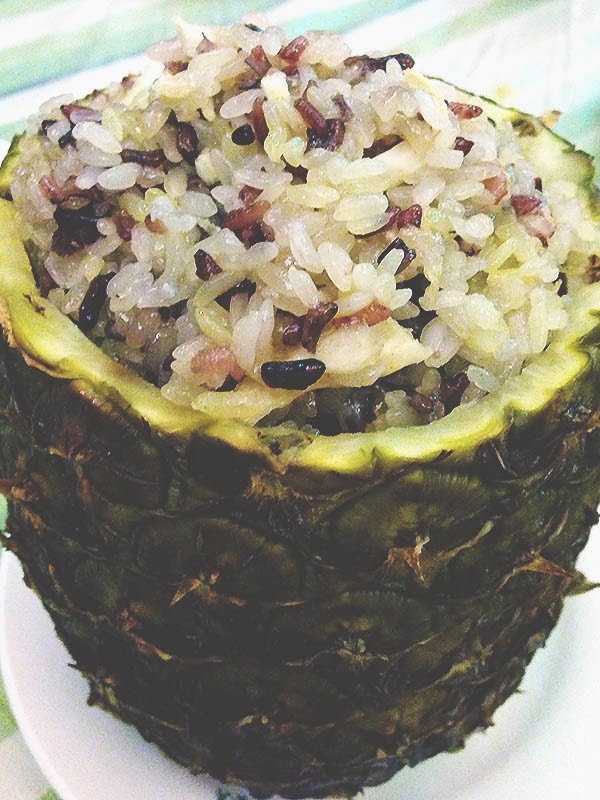 Though locals don't necessarily eat these things anymore, it's still fun to try. I had fried mini scorpions, grilled oyster, beef tripe 毛肚, and grilled cuttlefish. 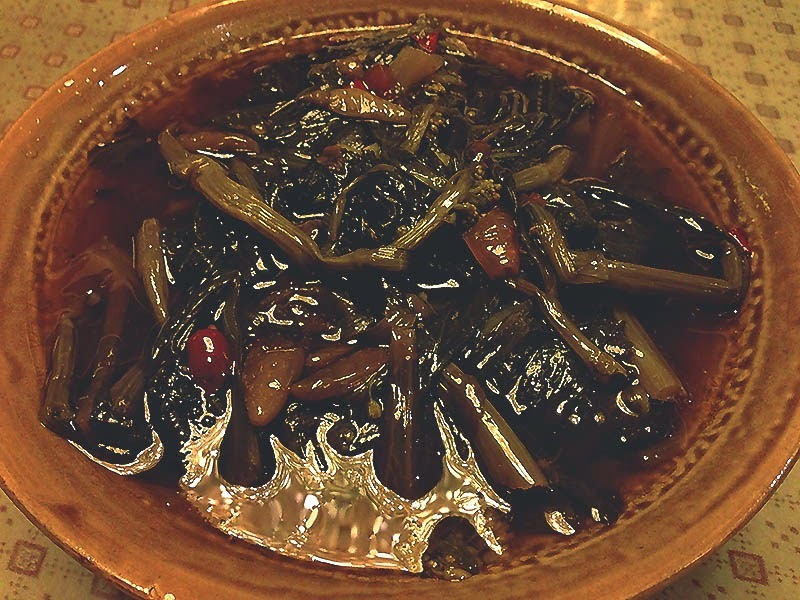 My dad tried some sheep testicle and my mom went for safer things like sharing the tripe with me and munching down on some candied hawthorn 冰糖葫芦, plum tea 酸梅汤, and clay pot yogurt 老北京酸奶. 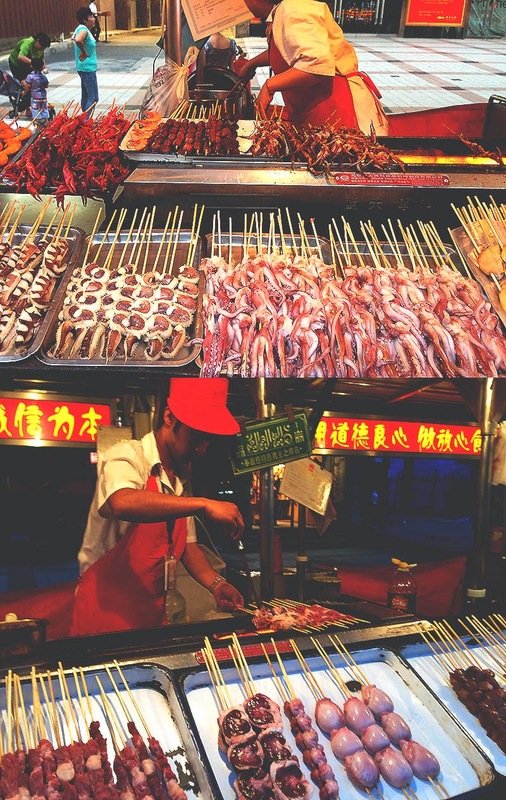 For something very authentically Beijing, the tripe, hawthorn, and yogurt are definitely recommended, but if you're feeling adventurous, why not go for some bugs on a stick? 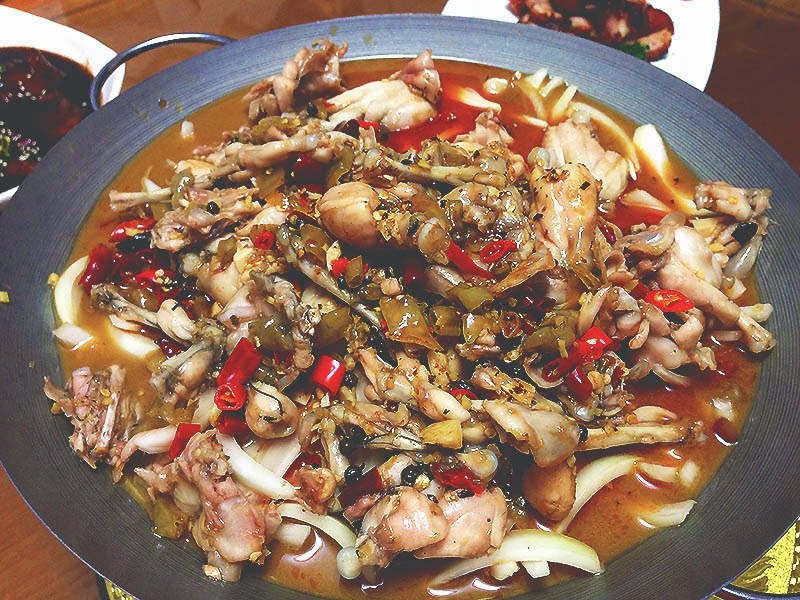 A common dish in China, but one that Beijing is particularly known for. It's a slightly soft, chewy, slippery, translucent noodle made from mung bean starch and served cold with garlic, cilantro, cucumbers in a vinegary, peanuty, spicy sauce. Enough said. 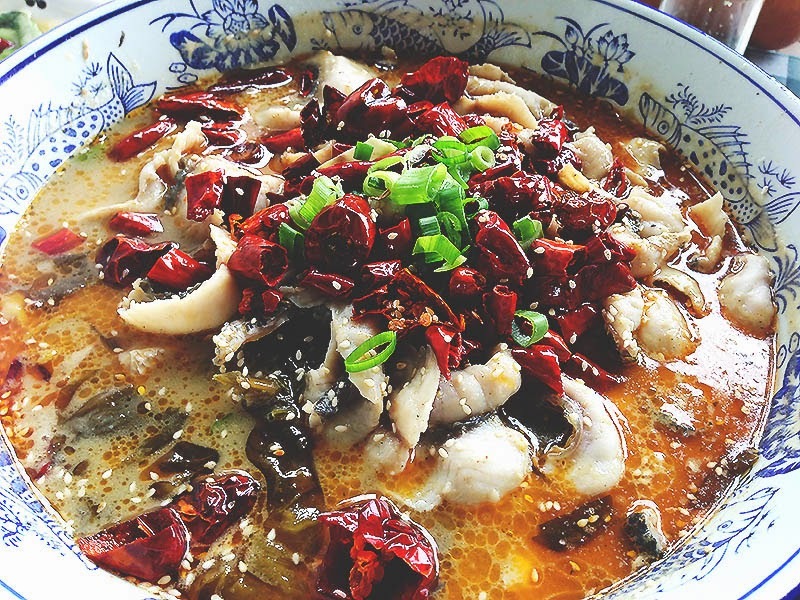 Though this is technically a Sichuan style preparation, it's a trendy dish in Beijing right now. 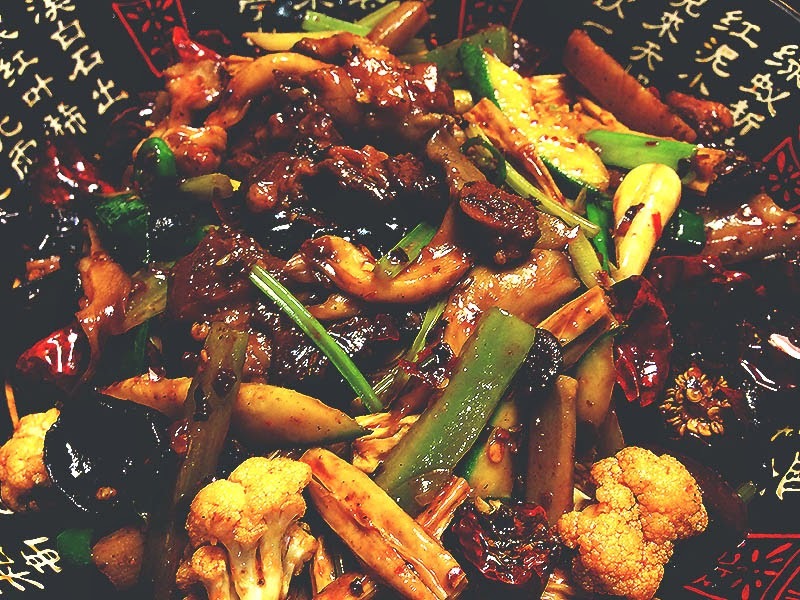 Every place prepares it different, but it is generally a mix of different meats and vegetables stir fried in a mala sauce. Here I had pork slices, pork hock, cauliflower, celery, woodear, chili peppers, and lotus root. From what I hear, donkey used to be poor man's food, but in recent years it has made it back onto the mainstream. Frankly, it has become my new favorite land meat (for me fish/seafood will trump land meat any day). It is extremely lean, not gamey, but more flavorful than beef. My dad and I randomly walked into a shop that specialized in donkey meat in a random hutong and decided to try it out. Awesome choice! We were both stuffed and my dad got a beer for about 30 RMB or just under $5. Hot, garlicy, and messy, these things are super addictive. You order by weight and the restaurant scoops up the live water snails and whisks them into the kitchen to cook. When the big, steamy plate comes out, the server gives you plastic gloves and tooth picks because this is definitely something to eat with your hands. Just use the toothpick to pick the meat out of the shell and enjoy! The Chinese are extremely into fresh meats. At the farmer's market, venders will usually be selling live fish or chickens which they they proceed to catch, kill, and scale/defeather in front of you. Of course, for the squeamish, you can have a restaurant do this for you instead. Find a restaurant located right next to a well known fishing spot that specializes in locally caught fish. Go to the tank and pick one that you think seems right (in Chinese, 看得顺眼) and then quickly run away before they scoop it out and kill it. 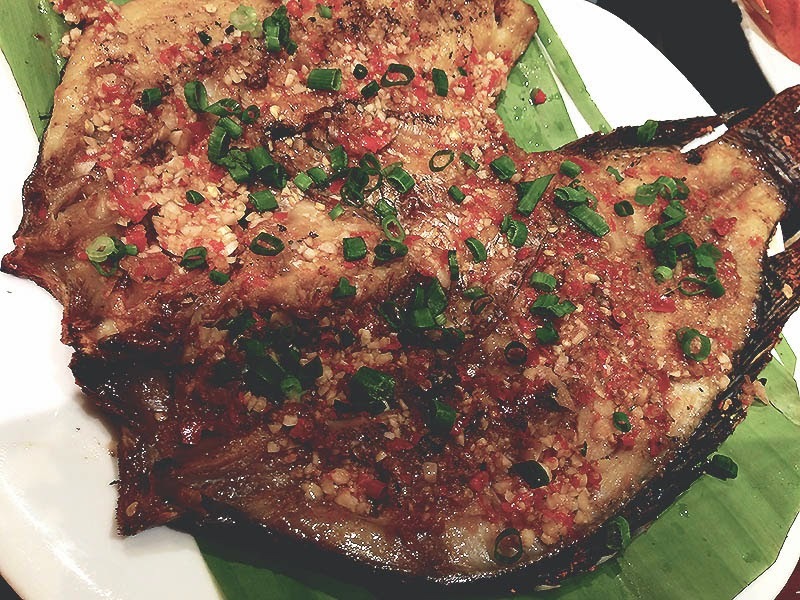 Here, we had the fish semi-filleted and then prepared with hot dried chili peppers and pickled mustard greens. 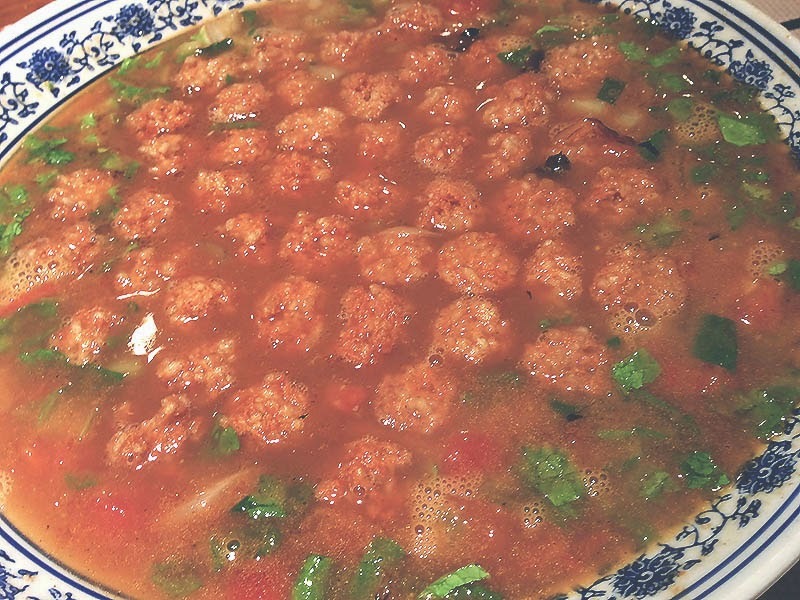 The spicy and sour combination is extremely appetizing and I could not stop eating it.